As per usual, Tesla CEO Elon Musk was full of exciting news at the annual shareholders meeting, held on Tuesday in Mountain View, California. The pinnacle of his speech was an update on the long-awaited Model X, an all-electric sport utility vehicle with incredible falcon-wing doors, which Musk originally promised for production in late 2013. This week, Musk said the Model X will be available as early as September of this year. The original plan for the Model X involved its release in late 2013 with 10,000 to 15,000 vehicles in production in 2014. Those plans were waylaid by a number of design complications, specifically related to those magnificent doors. Critics are calling the doors “gimmicky” but time will tell whether that turns off would-be consumers. Our suspicions are that it will not stand in the way of anyone interested and capable of purchasing a Tesla electric SUV. Musk took the opportunity to share a projected supercharger map for 2016. Tesla’s current network in North America includes 443 Supercharger stations with 2,465 Superchargers that allow Tesla owners to charge their vehicles for free. In the next year, Tesla will add a significant (but unspecified) number of new charging stations, expanding the network and making it much easier for Tesla drivers to travel freely around the continental U.S.
Musk also shared that he has been personally testing the “autopilot” system in a Model S electric car (Tesla’s only product, at the moment). He said the first version of the autopilot, which assists drivers with steering is scheduled to be rolled out to the first batch of customers in about a month. 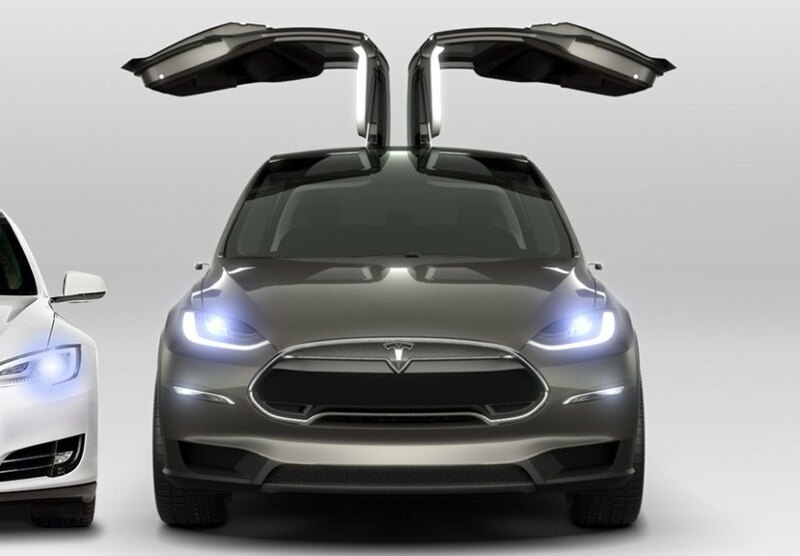 As for the Model X, those falcon-wing doors may have caused a lot of problems in the design and production thus far, but they’re so super cool, they might be worth the trouble. We just hope your garage has a really high ceiling. Not sure what the height to the doors when they are open but they look like one could bump into them. Lots of women well over 1.8 metres these days. Not all but many of the guys I know are 1.85m I wonder if they have taken this into account?